Born in El Salto, Durango in 1939, he lived his childhood in the City of Monterrey, where he started his artistic career as an industrial designer at La Fama Industries. Between 1955 and 1960 he studied in the Taller de Artes Plásticas of the UANL, where he became a professor from 1958 until 1961. He was also a professor of drawing in the Faculty of Architecture (1958-1961). His first exhibition was in 1956 in Monterrey. The very next year he had his first solo-show in Mexico City at the Galeria Diana and the Galeria de Arte del Gobierno del Estado. This same year he started working for David Alfaro Siqueiros in his workshop in Cuernavaca. In 1962 he worked with Federico Cantu on the stone mural of the Altars of Galeana in Nuevo Leon, in 1964 with Luis Covarrubias on the murals at the Museo Nacional de Antropologia and in Chapultepec, the Ex-Customs building and the Jorge Negrete Theater in Mexico City. In 1968 he was included at the Salon de la Plastica Mexicana. 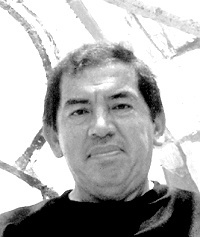 Ceniceros worked on the murals of the Siqueiros Cultural Polyforum. His life has been characterized by his immense love towards the arts. The testimony lies in his versatility, and mastery of a wide array of techniques like painting, drawing, engraving and sculpture. Ceniceros has a strong intention to transmit the joy of life in a universe where women have a special place. He made his debut as a muralist with a piece for the Ciudadela de Monterrey, in 1962. He went on to make other murals that can be seen in the Copilco and Tacubaya stations of Mexico City Subway and which got him nominated for the Premio Mundial de Arte. He has obtained many other recognitions such as the Public Education Secretary National Prize, the prize Salón de la Plástica Mexicana and the Medal to the Civic Merit from the Nuevo Leon Government. His work has traveled throughout the world to Ecuador, Venezuela, Cuba, Macedonia, Yugoslavia and the United States to name a few countries. In 1998, his home state of Durango renovated an old Hacienda from the 1800's to accommodate the Museo de Arte Guillermo Ceniceros in his honor.